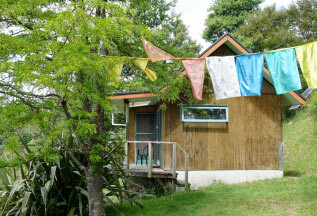 We have 3 self contained retreat cabins which are available year round for personal retreats. Whether you want to rest, meditate, write your memoirs or just enjoy sunrises and birdsong, consider coming to Wangapeka when you want time away. All three huts offer total privacy and stunning views. Facilities are basic but comfortable, and offer a genuine retreat experience in nature. Fall asleep with just the sound of the wind and the owls. Omahu Hut is a 20 minute walk from the carpark, up a sometimes steep and uneven path through the forest, but you will be rewarded with unparalleled views and the comfort of our newest cabin. With inside shower, cooking facilities, woodburning stove, single bed, small deck, and outside long-drop toilet. 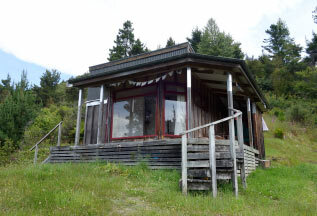 Namgyal Hut is a rustic characterful hut, situated a 15 minute walk from the carpark. The path is uneven and steep in places. 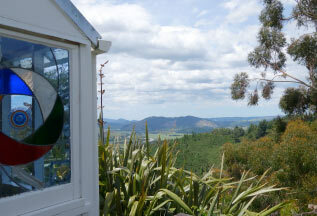 Fantastic views from the sun-room, plus gas heater, a small and basic kitchen, and outside long-drop toilet. Sky Dancer Hut is where most of our visiting teachers stay. A 10 minute walk from the carpark, it has a small deck with stunning views across the valley, a kitchen and inside shower, single bed and woodburning stove. Please contact us for more details about the retreat cabins, prices and availability, and get ready to experience our unique, affordable, private retreat options.